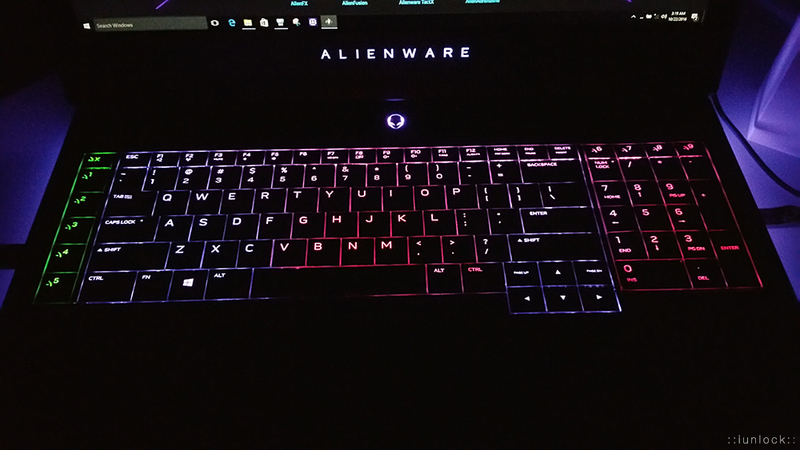 Discussion in '2015+ Alienware 13 / 15 / 17' started by iunlock, Oct 22, 2016. 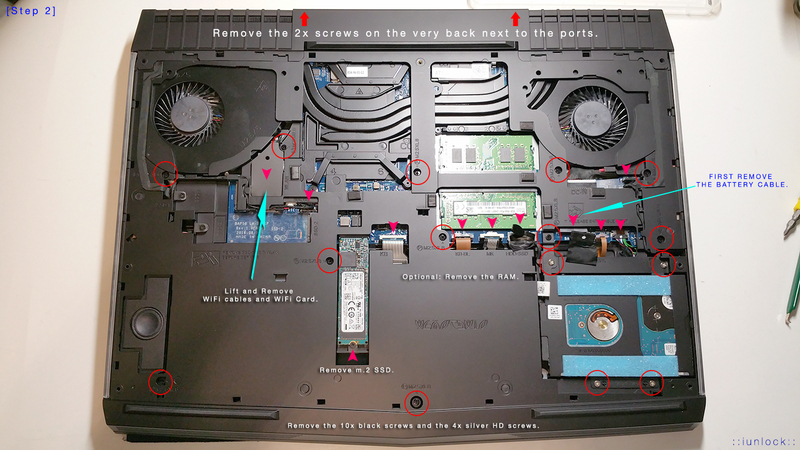 Will you be repasting your 17R4/15R2? And here it is! Pictures are a thousand words so I did my best to let it speak for itself. Hope this helps! 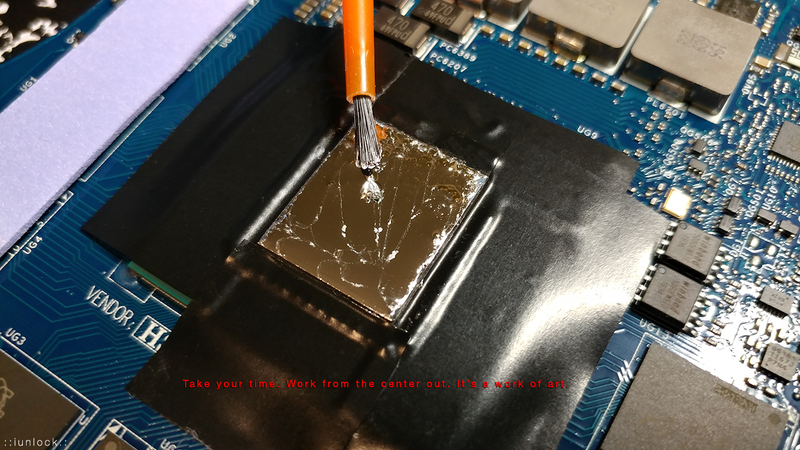 You can use Isopropyl Rubbing Alcohol as well, but make sure to get at least 70%. I usually use 70% at first, then polish it off with 91% if I'm ever out of ArctiClean, which is almost never. 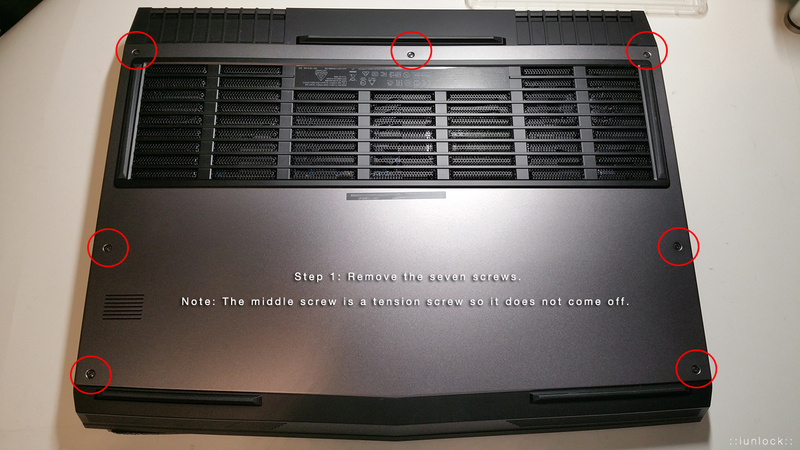 Make sure to keep your screws organized. 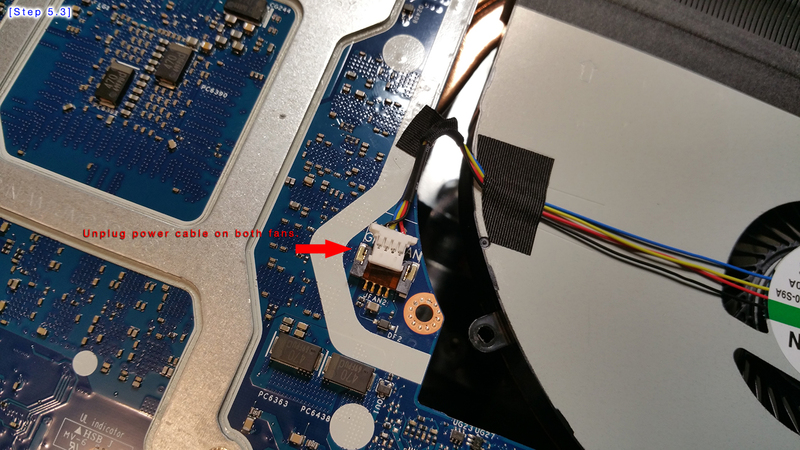 Here's a quick video on how I remove the WiFi cables. Haven't broken a pin yet....hope this helps. 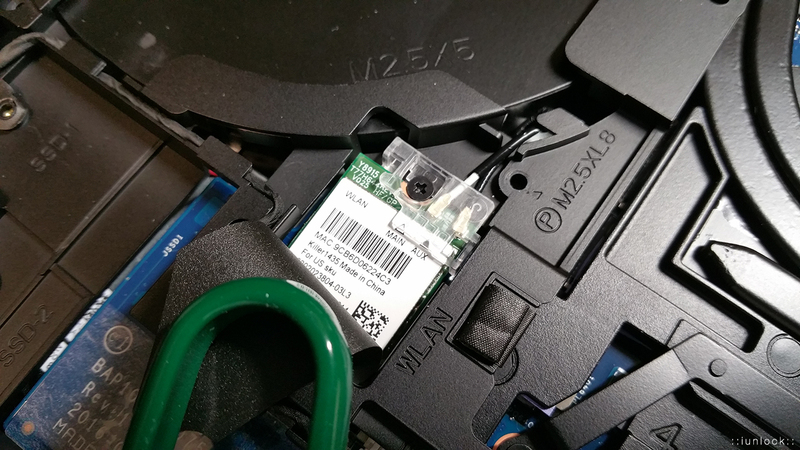 Use a plastic pry tool and work your way around the laptop. 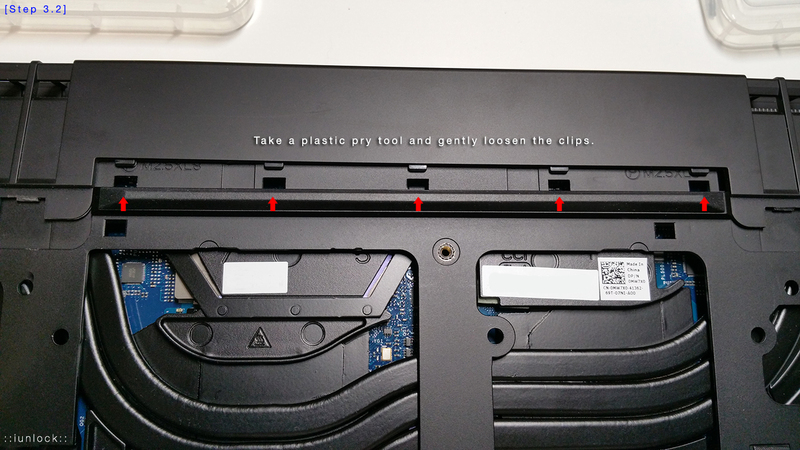 It's kind of like the taking the top keyboard part off of the 17R3, only this is the bottom panel cover. 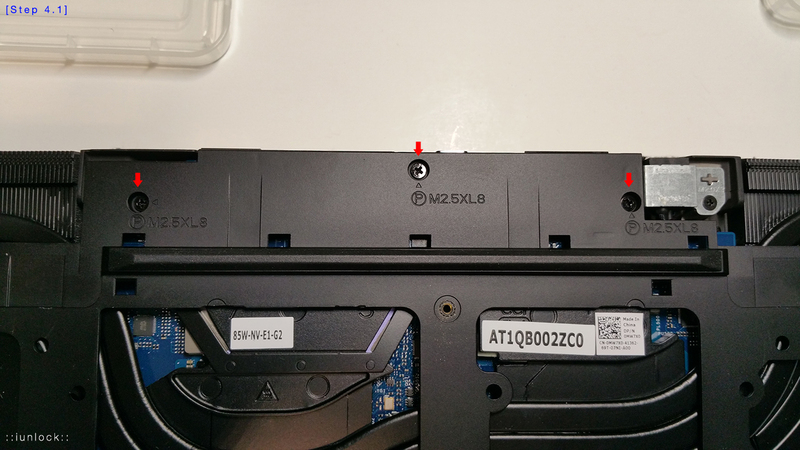 It's easier to keep the heat sink unit intact until you undo the two fan plugs on the back side of the mobo. 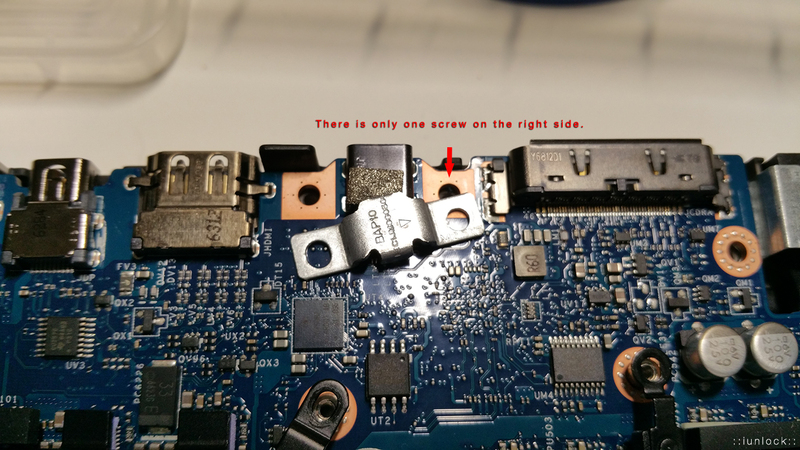 Make note of this...there's only a screw on the right side. 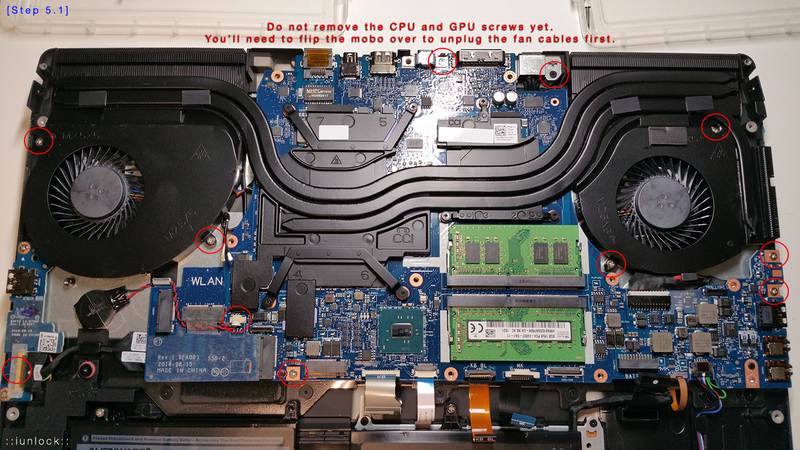 Make sure to unclip these before removing the mobo. 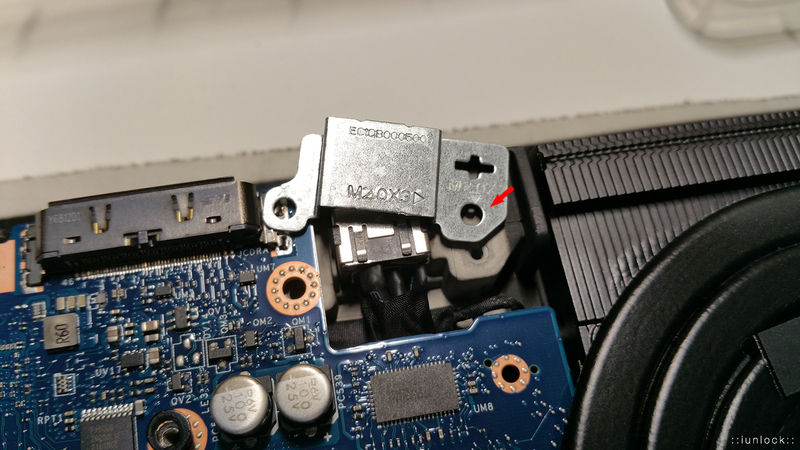 That's the power connector that needs to be unclipped before taking off the Heat Sink unit. That's how it looks with the mobo off. Very solid...metal everywhere...it's a tank. 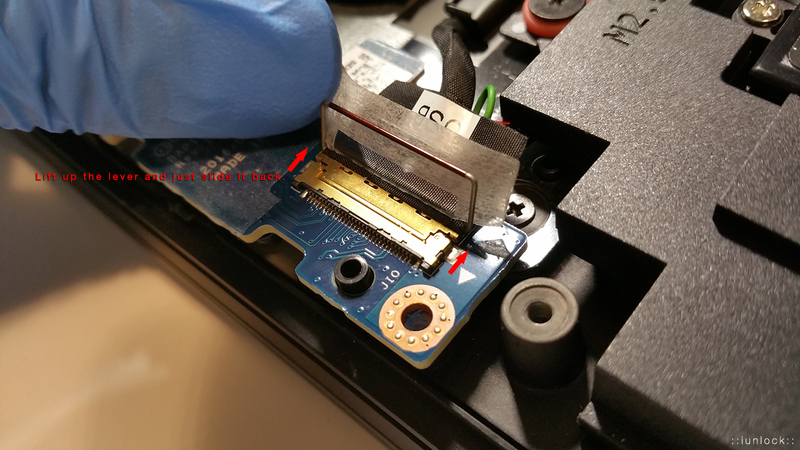 * It is highly recommended to do as many dry runs (after cleaning off the paste on the heat sink) and to measure the gaps of where the stock thermal pads are located. 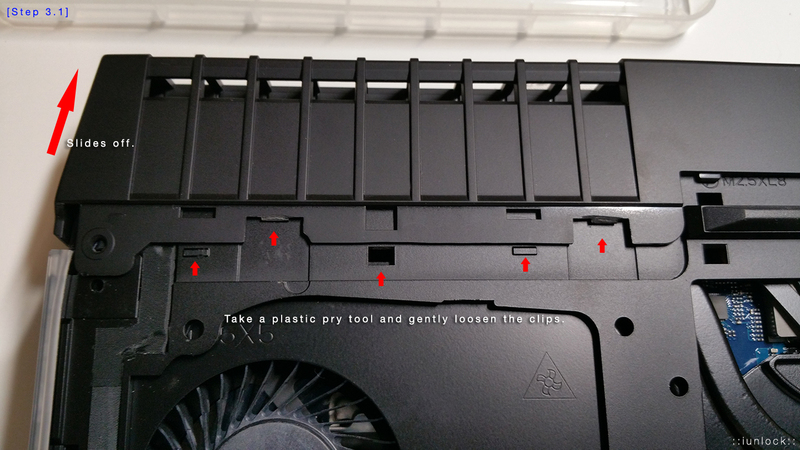 There are different variants of the heat sinks so the tolerances can be off by a lot. 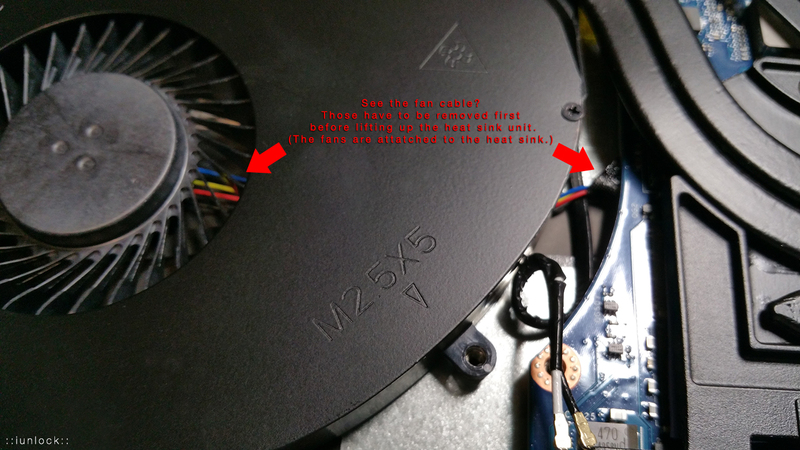 Not all of the heat sinks are created equal. 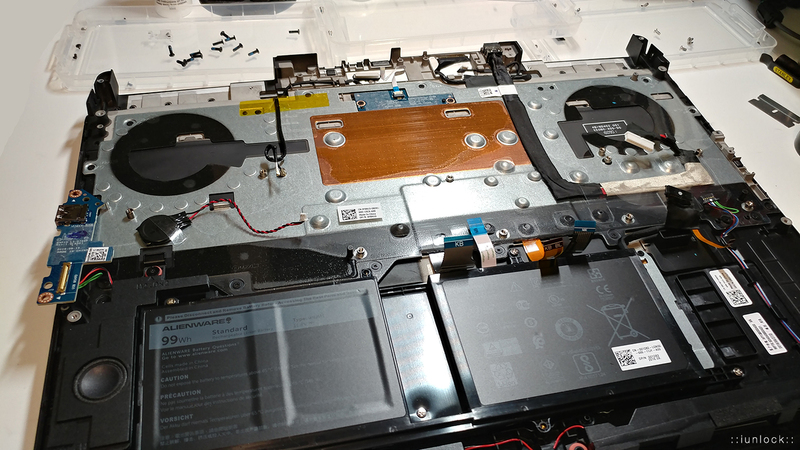 Some areas may need a thicker thermal pad to ensure that there is good contact with enough pressure to allow the thermal pads to function at its peak. 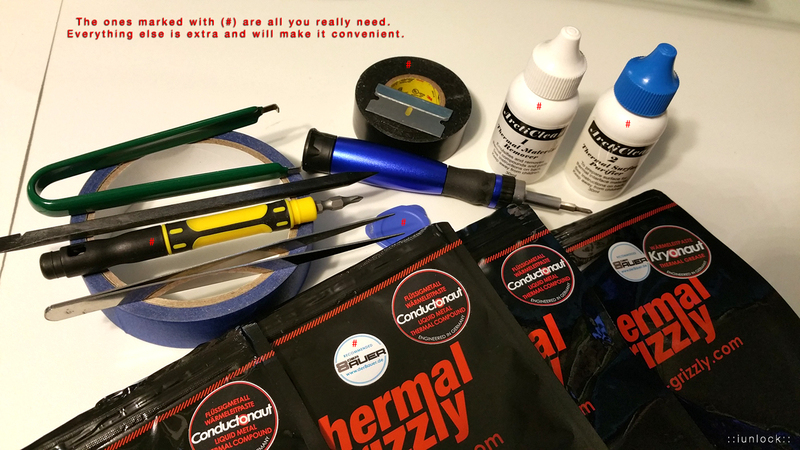 A thermal pad that is simply just sitting there and looks like it's touching both contacts will not provide the proper heat dissipation. Therefore, please use the info. below as a general guide. 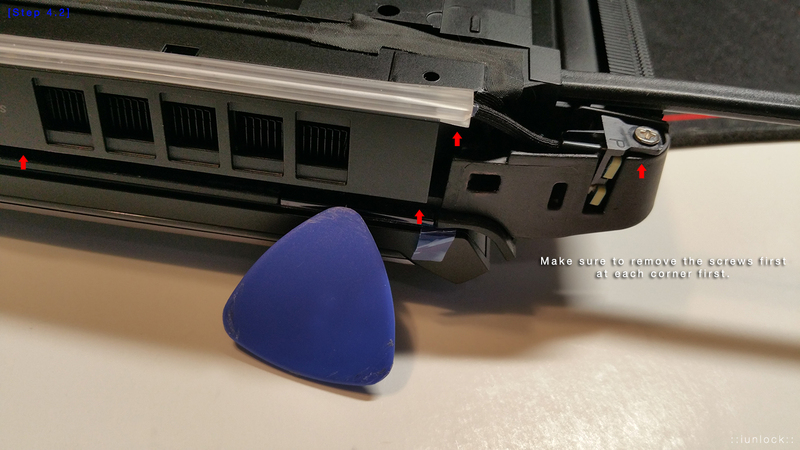 It would help to order more larger sized pads (1.0mm and 1.5mm) just to be safe. 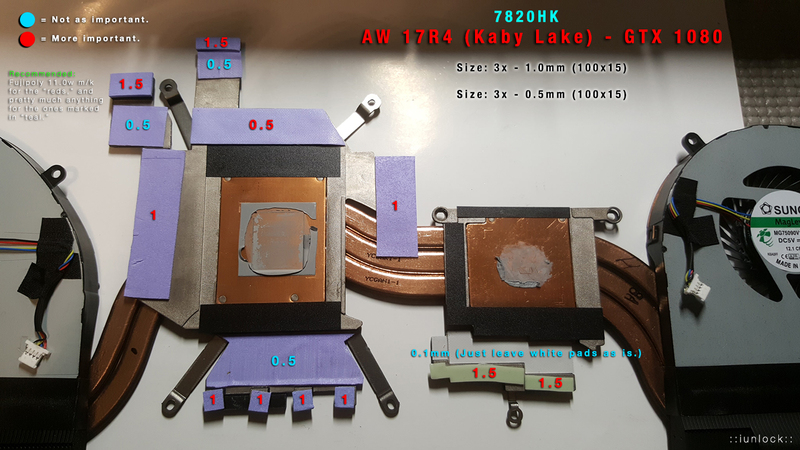 There are two variants of the 1080 heat sinks. CCI and SUNON. 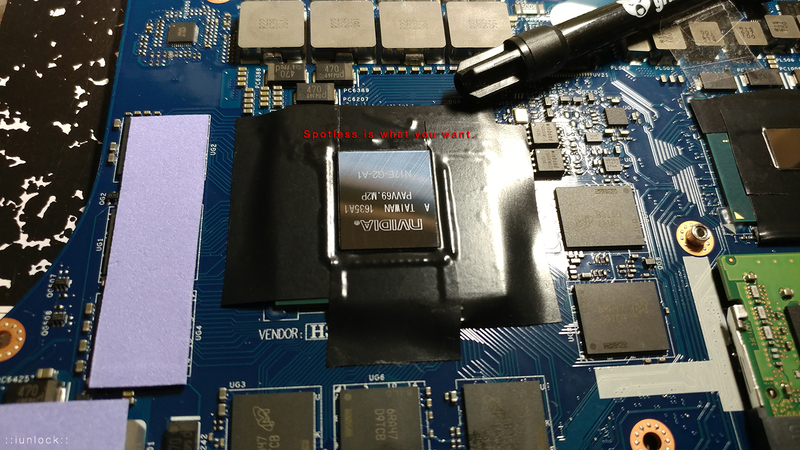 The good one is SUNON, but you'll still want to do some dry runs on putting the heat sink onto the motherboard to measure the thermal pad distances, just to be sure. 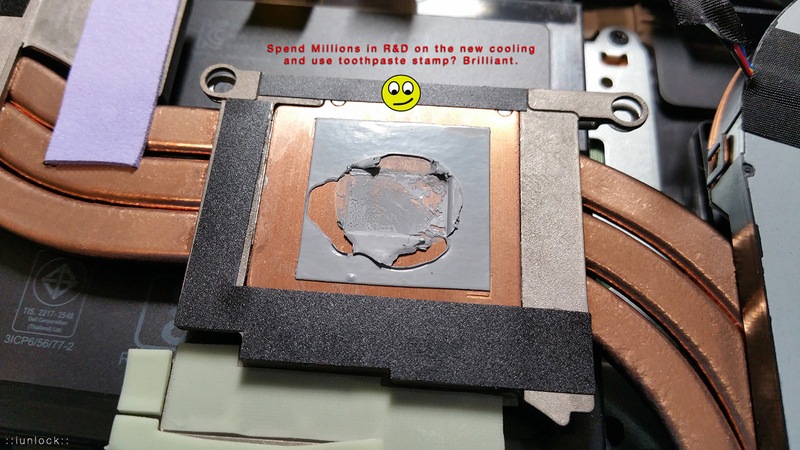 I mean...it's unreal how they spend all this money on R&D etc...then crap on it with cheap toothpaste? Oxymoron....I just don't get it. 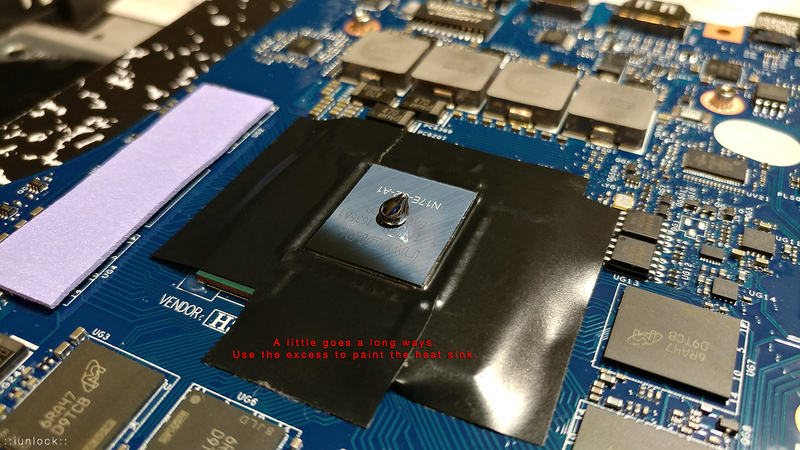 That drop is enough for the die and heat sink...It looks like a lot and for it being liquid metal it usually is, but for laptops you do have to be a bit more generous with the LM, hence the electrical tape protection just in case. I usually don't make the box area that big as the die size is much smaller. It really doesn't matter. 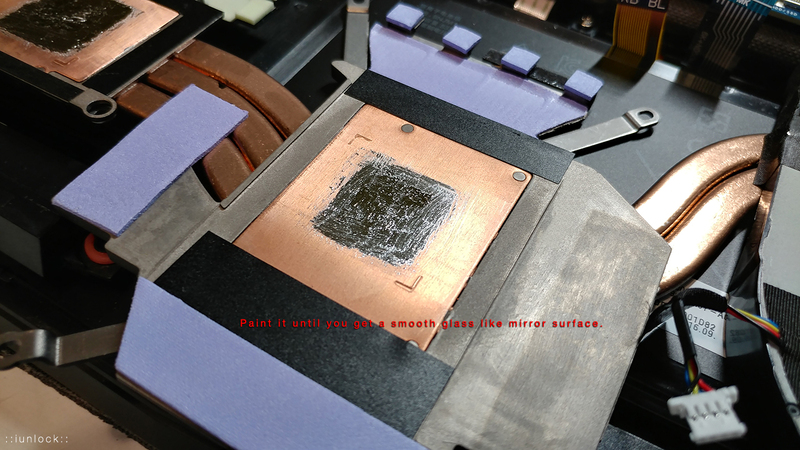 After you work at it for a while, it will start to get into the micro pores if you will of the copper and all come together to make a nice shiny glass like surface. It's actually quite nice. Get ready for some amazing temp drops...Liquid Metal is the real deal. Thanks for being patient guys. I just had to make sure before publishing this (long duration tests)...many many tests later, it's sealed and confirmed. It works great. 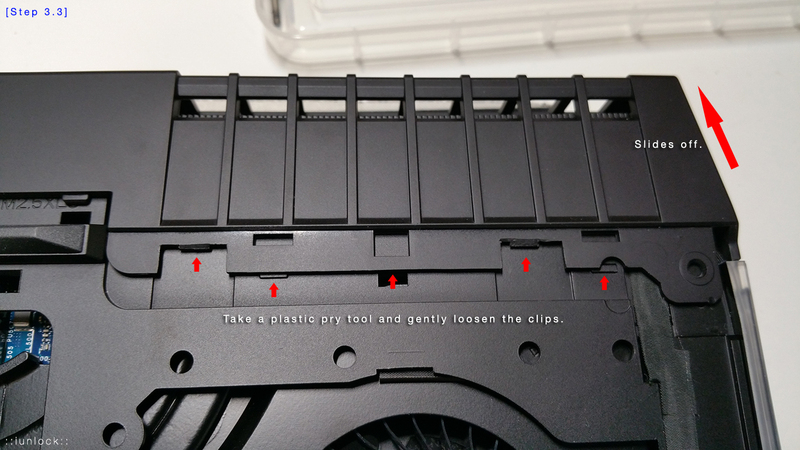 Note: Notice the orientation of the fins (horizontal). Also, the height you want is approx. ~4-5mm. The size of the actual HS doesn't have to be exact. I may even end up trying a bigger size (width) later and test to see if it makes any distance. 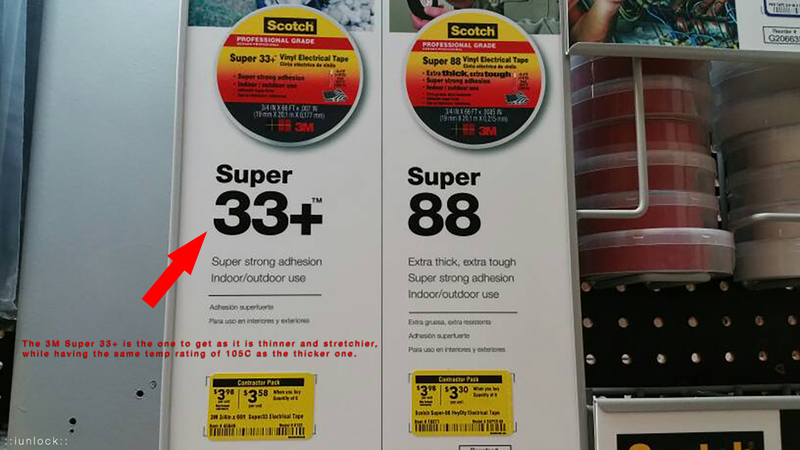 The thing you don't want happening is having the rate of thermal dissipation exceed the amount of air flow that's under there for obvious reasons. 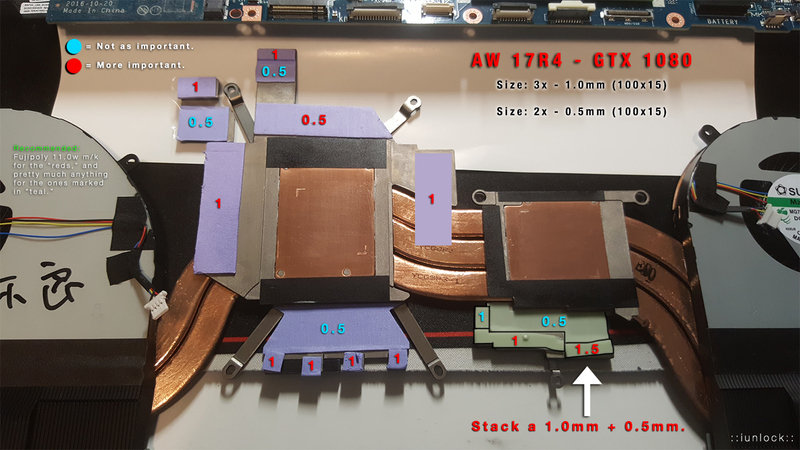 I'd like to give a big shout out to @DeeX, @zergslayer69, and all the others who have shown support with the AW17R4 project. 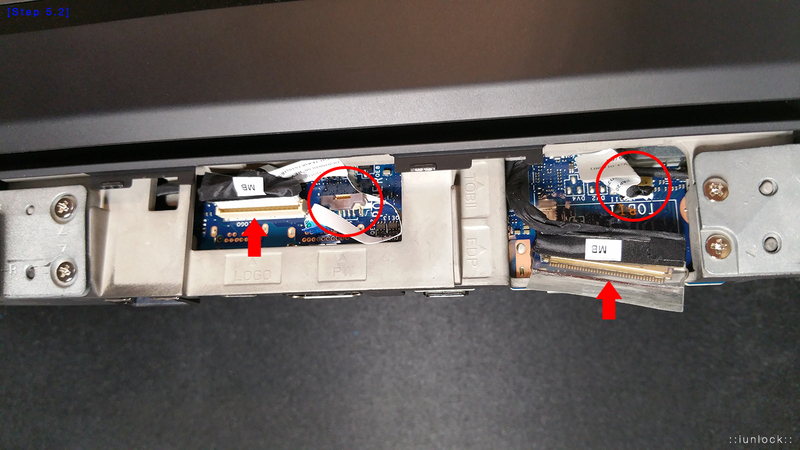 Have questions in regard to repasting? 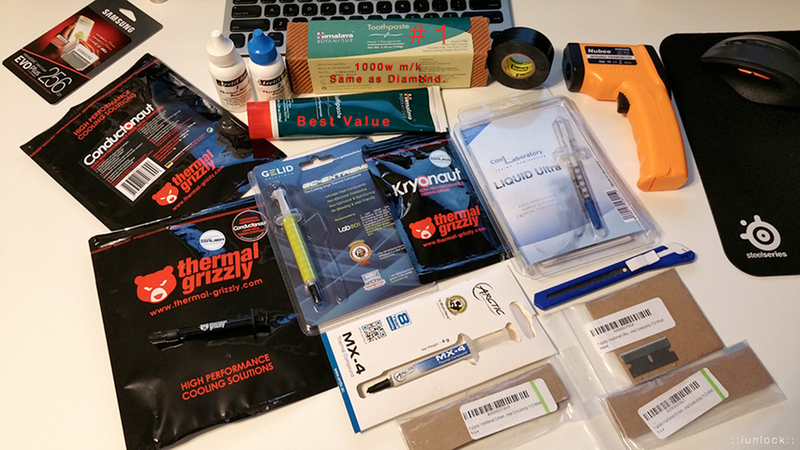 PM with any questions and I'll be glad to help. I'll be adding more goodies so stay tuned. Steven Rice, gregmattersen, mihaispd and 31 others like this. 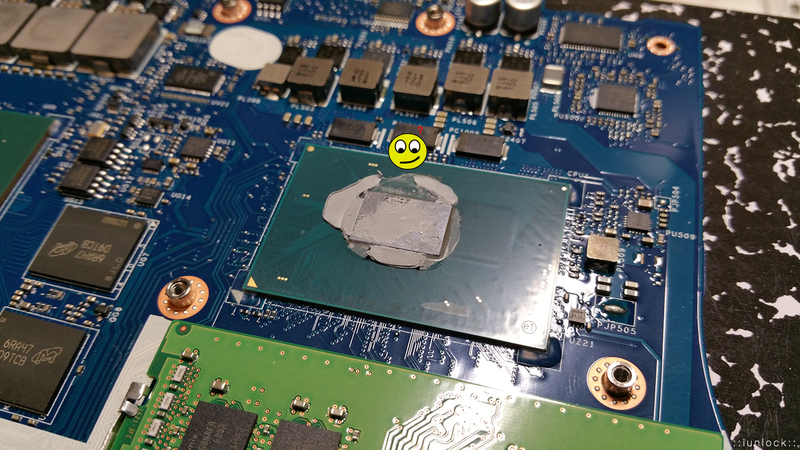 I've decided to repaste one of my 17R4's with Grizzly Kyronaut to collect some data and to see what it can do. The results are pretty enticing. My goal was to see exactly what Grizzly Kyronaut can really do at its peak potential. Initial temps were actually about 4-5C higher at first, but I immediately went into some heavy testing and shortly after started my 6 hour long Fire Strike loop. 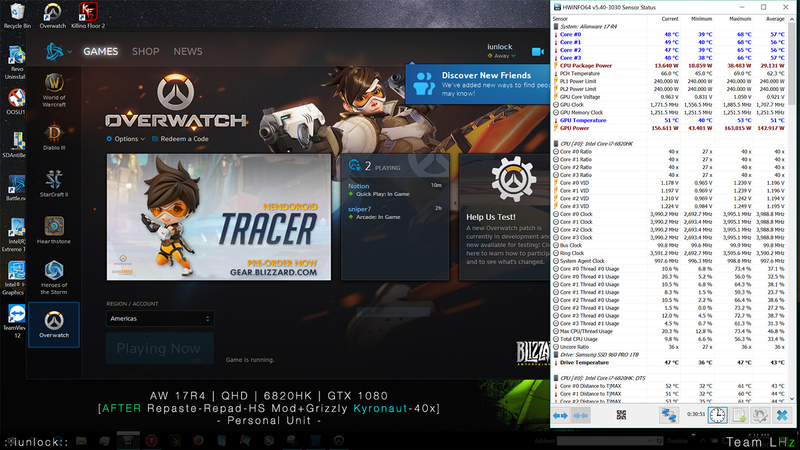 Note: The GPU does seem to run 5-6C cooler with the Grizzly Kyronaut when playing OW. 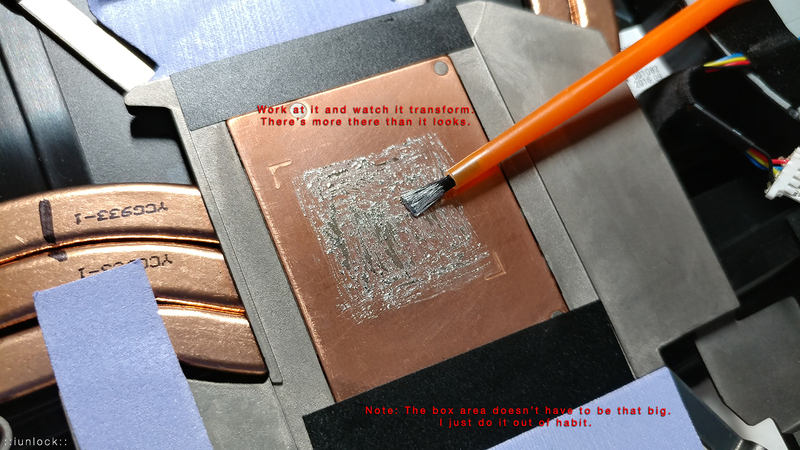 However, when it is stressed for long period of time, the LM is more sustainable as I think the nature of traditional paste kind of looses it's integrity under over the top unrealistic extreme conditions like a 6 Hour FIre Strike Combined Loop Test lol...Just thought it'd be worth noting. AFTER: Grizzly Kyronaut, HS Mod/Fix, Repad, and a ton of time balancing the stupid HS. 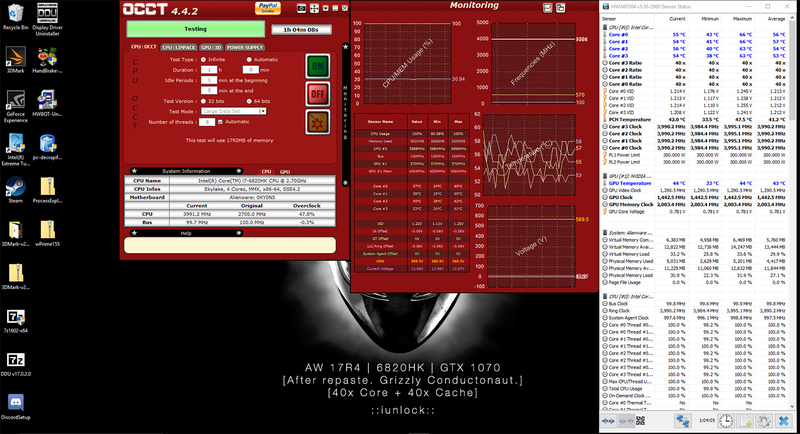 I've figured out how to OC the CPU to 7.77GHz with the fans completely turned off by tuning the LED's. Don't lie...you know that looks fresh. 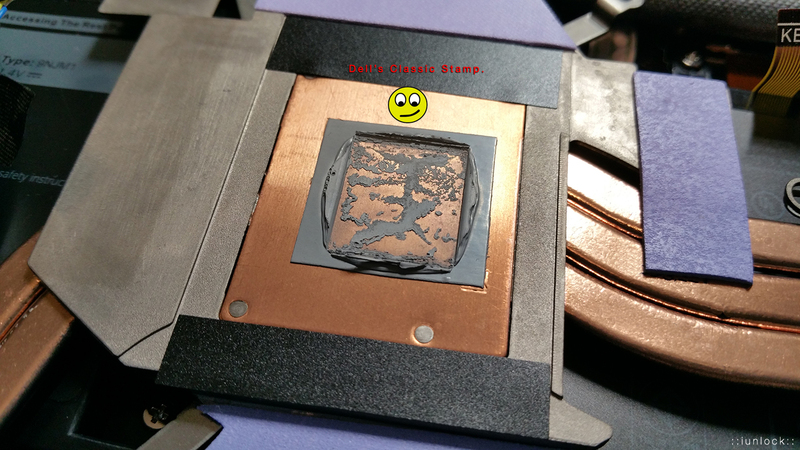 K guys...fresh off the press...I'll be running a bunch of benches tonight to obtain some stock figure then likely tomorrow I'll do a full disassembly and repaste with none other than LIQUID METAL! Grizzly Conductonaut to be exact. 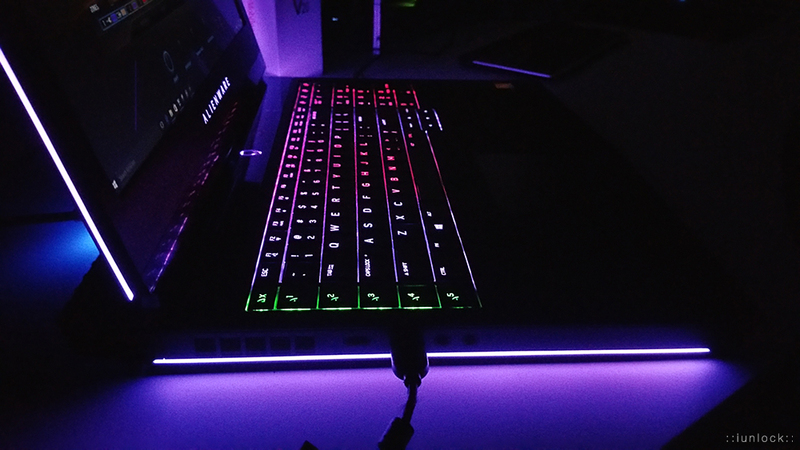 The keyboard is pretty cool to touch as the heat is really concentrated toward the back as it was designed to do. bagiano, Muezick, 5tormyweather and 4 others like this. can you give me the wallpaper with the badass eyes ... ? Vasudev, Freitz and iunlock like this. 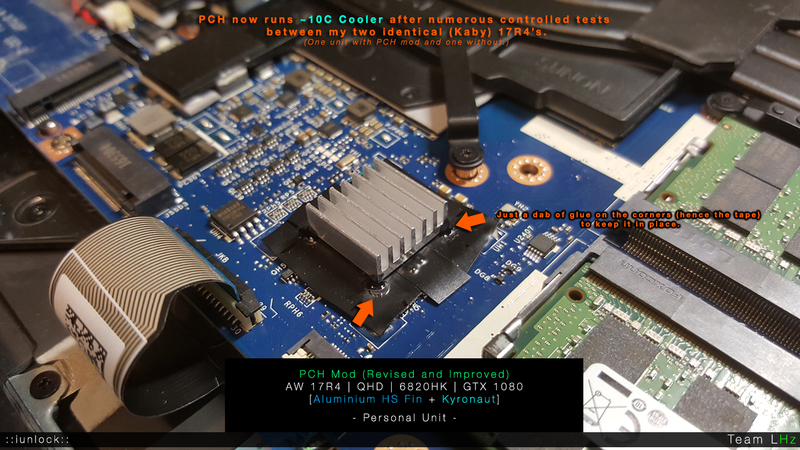 So i am abusing ur thread for posting my results sorry iunlock i have to say that this cooling solution is ****ing amazing! 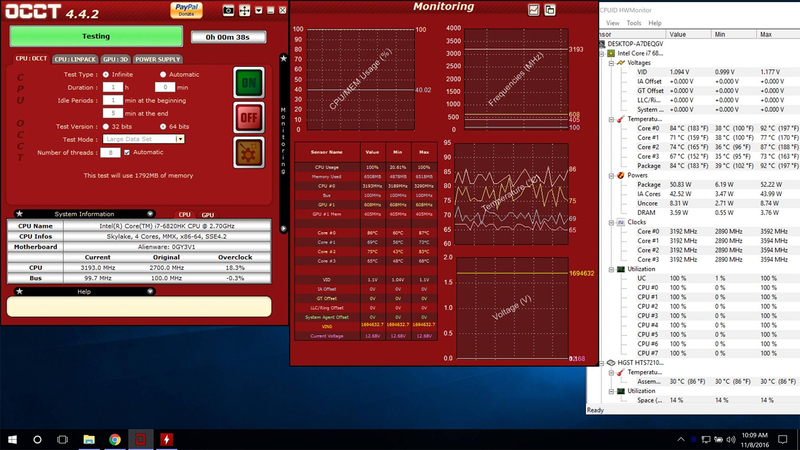 For real my temps wherent this low since my M17x R4! And this is even the 15... 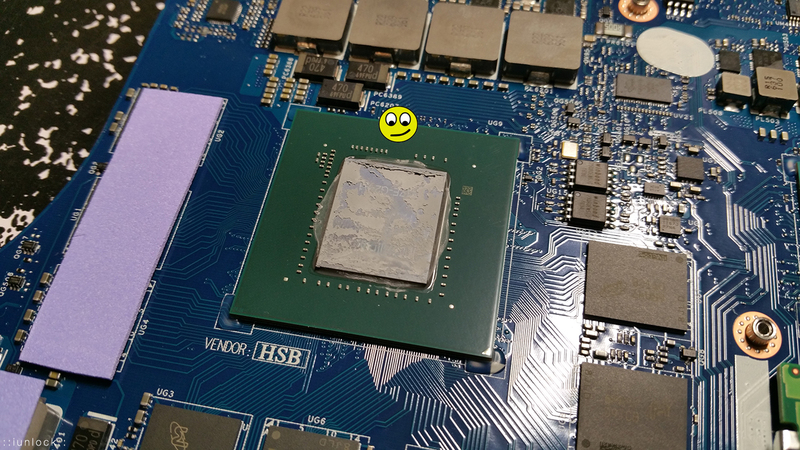 I only can recommend every1 to do a repaste with lm! This is so freakin amazing! 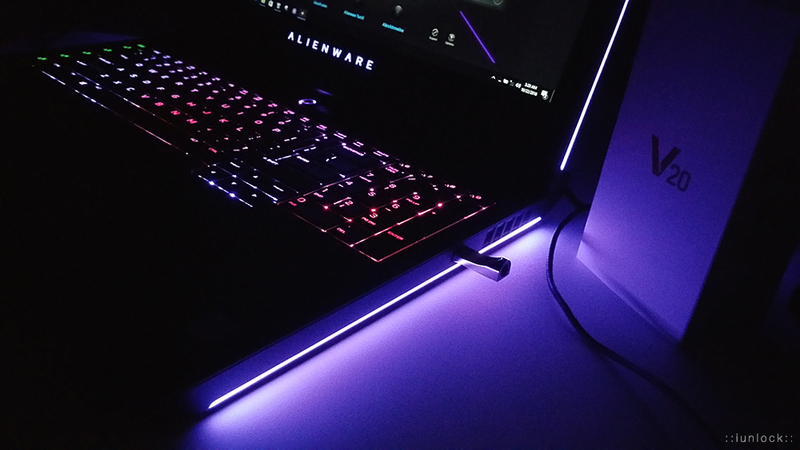 Really happy with this thing! *EDIT* Why doesnt it show my images? hmscott and iunlock like this. No worries! 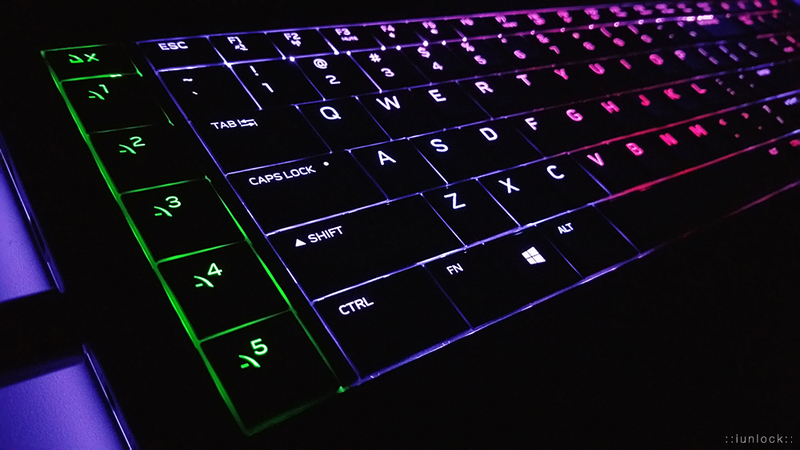 I have just finished gaming and am about to post up my results as well. 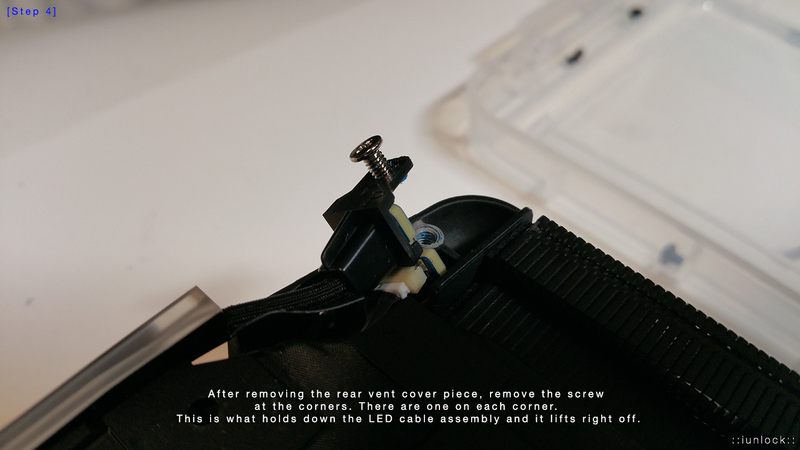 This is great...thanks for sharing and yes the new cooling solution of the AW is a hit (good) and not a miss. I actually like how much this thing weighs....feels confident. Daniel1983, ThatOldGuy, hmscott and 1 other person like this. do u've got occt or unigine results? I'm a bit surprised myself on the numbers that it's producing on the bone stock configuration. If you search on 3DMark.com, and look at my recent fire strike and time spy submissions, the scores of others around mine have much higher OC's so I'm really excited to see what this can produce when I actually do OC, which will likely be later today. quickie and stray647 like this. 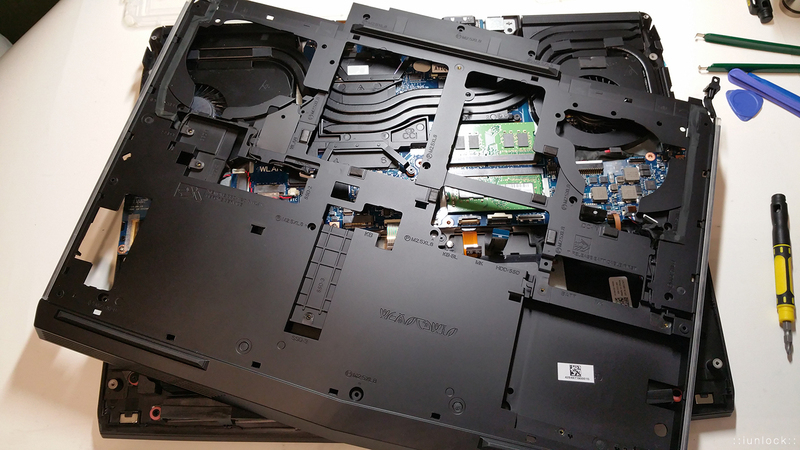 I received my 15r3 Friday 6820 1070 UHD. 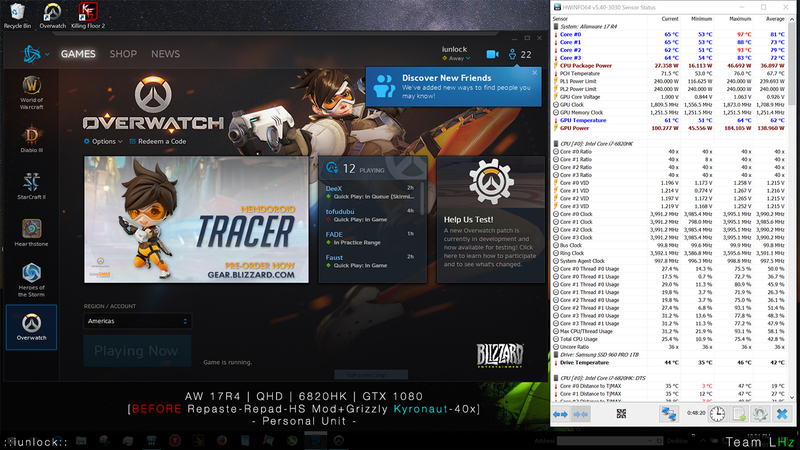 CPU temps hit 98c in battlefield and GPU hit 89c. Its going back Monday I am not even allowing anyone to come work on a 3k system. I will either order another or wait and get the 13 with oled. 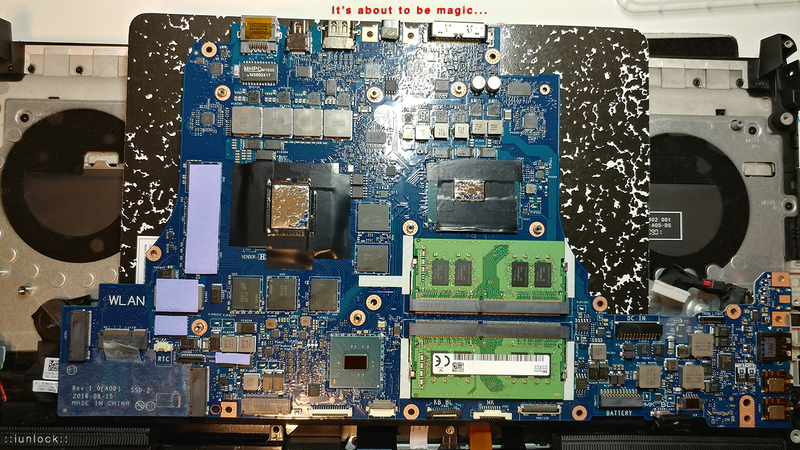 I love the 15 but mine either has crap paste job or no paste and I am not flipping out the entire motherboard to repaste it.